An early summer blooming perennial is the coastal gumplant (Grindelia stricta platyphylla). It grows 6” tall and 3’ wide, and is a good edging plant for full sun. Yellow daisies in June through August attract butterflies, skippers, and other insects. Contrasts well with large plants such as deergrass (Muhlenbergia rigens). Coyote brush (Baccharis pilularis) is a common upright shrub in many parts of California. 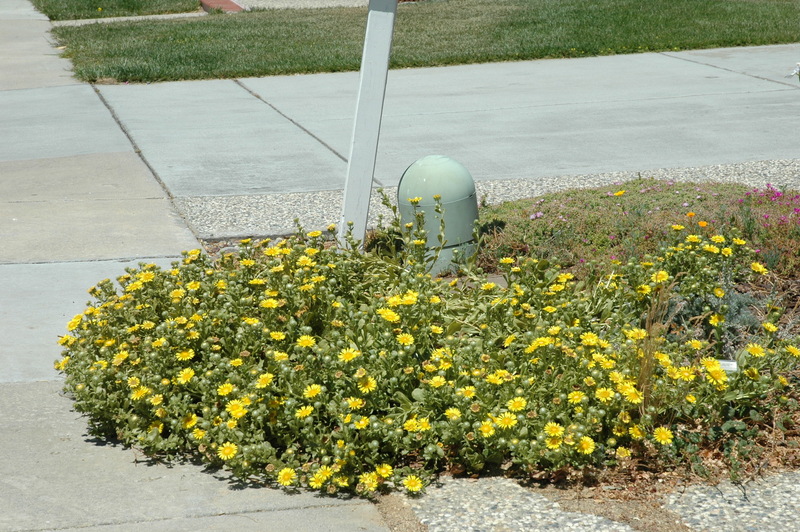 Near the coast, mounding forms occur naturally that perform well in gardens as groundcovers. Several cultivars are available in the trade. ‘Twin Peaks’ grows 3’ wide, 1’ tall, and is slow growing. ‘Pigeon Point’ gets 2’, 6’ wide. Prune upright branches to keep it low. Combines well with the gray leaves and red flowers of zauschneria (Epilobium canum) in summer. Resents summer water. 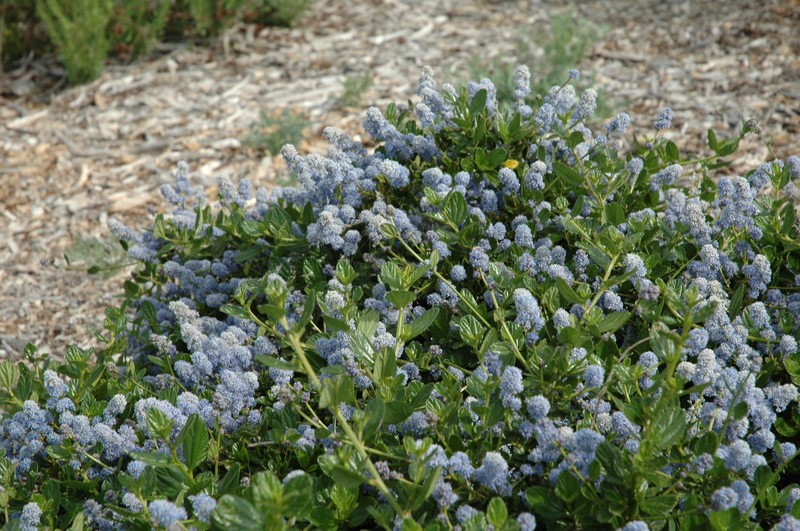 For a year-round display of shiny, dark green leaves, nothing beats Yankee Point ceanothus (Ceanothus griseus horizontalis). 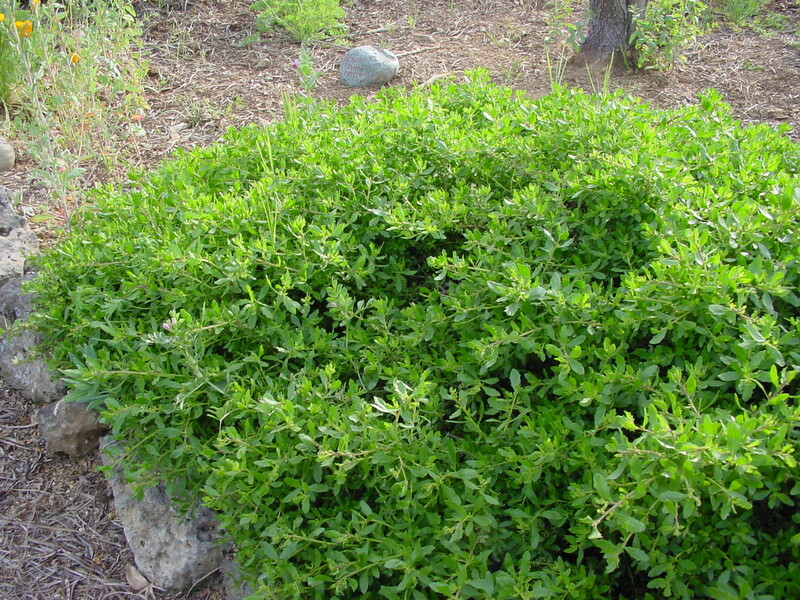 This low, mounding shrub loves full sun, and grows 2’ tall and 10’ wide, and forms an excellent groundcover. Prune upright branches regularly to give it a low profile. Lovely blue flowers in early spring attract butterflies, bees, and other pollinators. Bullet proof. The Channel Islands are home to a lovely subshrub that stays green all year long. The showy island snapdragon (Galvezia speciosa) grows 2.5’ tall and wide. 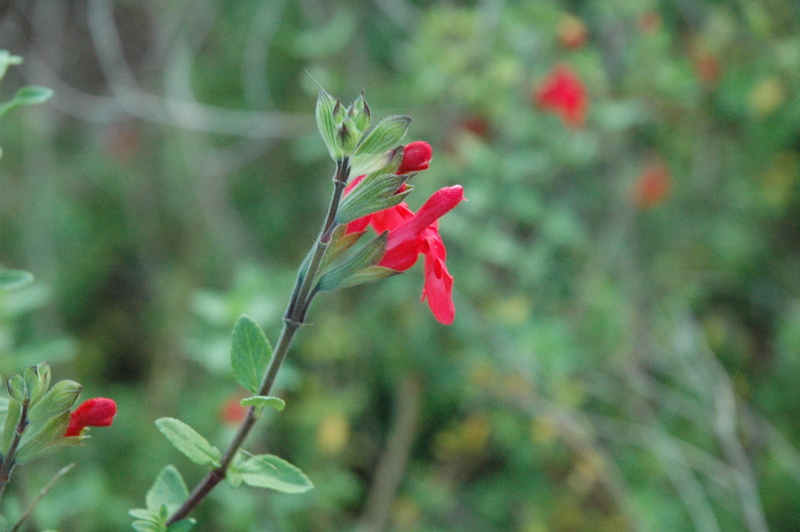 It does better in part shade, and sports red snapdragon flowers that attract hummingbirds eight months of the year. Easily pruned and easily propagated. Protect from frost. 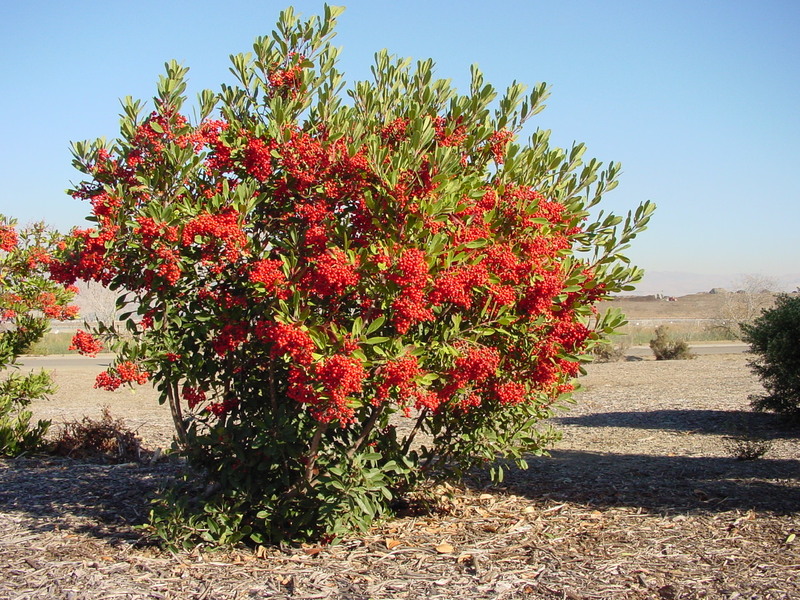 Among large shrubs, none are as beautiful or versatile as the evergreen toyon (Heteromeles arbutifolia). In sun, it becomes a dense shrub to 8’ tall and wide; in shade, it can be a 20’ tall lanky tree. Frothy white flowers in May-June lead to green berries which turn bright red by December, and offer a colorful feast to winter visitors such as cedar waxwings. 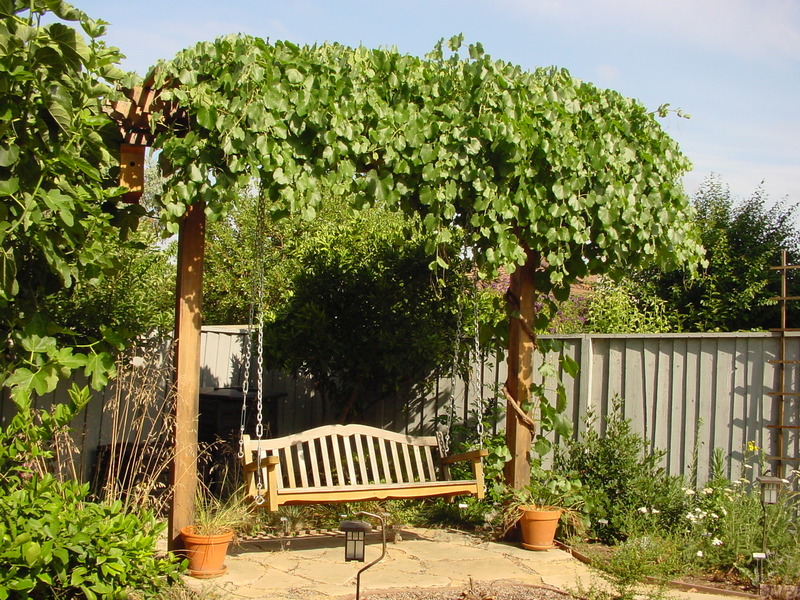 For summer shade, try draping the California grape (Vitis californica) over a trellis or pergola. In nature, this winter-deciduous creeper occurs near streams, clambering up trees for light. In the garden, keep it in check by holding back on water and pruning a couple of times each year. Produces large-seeded grapes that make superlative juice. Leave some on the vine to make raisins for the birds to snack on all winter long. Few trees are as well adapted to California summers as our native oaks. For an evergreen variety, try the coast live oak (Quercus agrifolia). This is a slow growing tree which for many years will remain a large shrub, frequented by birds and other critters. For a deciduous and relatively fast-growing tree, try the valley oak (Quercus lobata) which is tolerant of clay and grows faster with summer water. This is just a short list of summer-green native plants that grow well in my San Jose garden. There are many more. I encourage you to explore and experiment and share what you learn. This entry was posted in Garden Design, Seasonal Gardening and tagged Garden with Natives, native plants, Seasonal color, summer green, water saving, water-wise. Bookmark the permalink. Love the Grindelia recommendation. I don’t often see that plant in gardens, but it does make an excellent show of color in the summer, and I like the bright green leaves. Do you this that particular species is the one I saw on the Mendocino coast last week? It was beautiful on the cliffs among the Eriogonum latifolium and Erigeron glaucus. I even saw some growing among pickleweed along Big River. It may well have been the same plant, as it grows all along the California coast. The leaves are the widest of any gum plant in my experience. I prune it annually. Last week I found a giant praying mantis living in it — that was neat! Arvid, thanks for posting about summer greens. The baccharis is such a reliable and steady plant altogether – I just love it. And of course the ceanothus adds such elegance – those beautiful dark green leaves. I also like lemonadeberry for a big green shrub. Love these articles, keep them coming…. I really like my Mahonias/Berberis repens, Mahonia pinnata ‘Ken Hartman and aquifolium. Plus my Rhamnus californica Eve Case and my Trichostema lanatum (bloomed on and off all year) and all look good year round with the fuschias, gumplant and deergrass at 2400 ft in the Sierra Nevada, south slope. Susan & Cyndi, those are great suggestions for summer-green plants! Lemonade berry does really well in San Jose as does sugar bush, although both shrubs are from Southern California. I am growing Berberis aquifolium repens — it is slow growing, but the leaves are beautiful year round.